I just looked through the variety of graphical depictions of the human-centered design process that I show to and discuss with my master’s degree students during the first class of the semester. Sure enough, none of them includes a step often called reframing or a step that obviously includes reframing. Hmm... Does the design process followed by many fail to include that activity? I think it does. Hence, I think many designers spend a lot of their time trying to solve the wrong problem. Fortunately, I've been increasingly running into references to the importance of reframing. At the recent Healthcare: Refactored conference, Aza Raskin argued that we are still solving the wrong problem in healthcare, a part of the solution: "re-ask the problem; reframe it." At the recent Healthcare Technology Forum Innovation conference, Gavin Newsom argued, "If you don't like the answer, ask a different question," and Dennis Boyle argued similarly but went further: "Ask whether you are solving the right problem; understand those whose problems you are trying to solve." "At the Stanford d.school, students are taught how to empathize with very different types of people, so that they can design products and experiences that match their specific needs. When you empathize, you are, essentially, changing your frame of reference by shifting your perspective to that of the other person. Instead of looking at a problem from your own point of view, you look at it from the point of view of your user. For example, if you are designing anything, from a lunch box to a lunar landing module, you soon discover that different people have very diverse desires and requirements. Students are taught how to uncover these needs by observing, listening, and interviewing and then pulling their insights together to paint a detailed picture from each user's point of view." "Interviewing customers is tremendous for driving reframes, which are crucial shifts in perspective that flip an initial problem on its head. These new frameworks (which come from rigorous analysis and synthesis of your data) are critical. They can point the way to significant, previously unrealized possibilities for design and innovation. Even if innovation isn't your goal, these frames also help you understand where (and why) your solutions will likely fail and where they will hopefully succeed." When trying to solve "wicked" problems, (transformational) innovation often needs to be your goal. Hence, reframing is essential, as argued by Hugh Dubberly and others in an interactions magazine article entitled "Reframing Health to Embrace Design of Our Own Well-being." In a BayCHI presentation of some of this material, Rajiv Mehta and Dubberly argued that failure to reframe is why most healthcare apps developed to date have had only a modest impact. Who is responsible for design might partly explain the frequent failure to reframe. Aza Raskin (see earlier reference) says "the problem in healthcare is that design is now mostly in the hands of medical gurus." Don Norman has argued that "engineers and MBAs are fantastic at solving problems, but they aren't any good at making sure it is the right problem." Regardless, if "reframing the question" is "one of the most important principles in design" (as Tim Brown argued recently), then we should do a particularly good job of teaching it and making sure it is done. 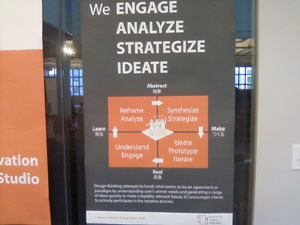 This includes including it in our graphical descriptions of the human-centered design process. Clearly, I need to add these two depictions to the collection that I share with my students.